thoughts & happenings: At home. The front yard/garden has been stripped of it's lawn with instant lawn going down later this week, fingers crossed. The day the deed was done I looked after 5 grandchildren had 3 to sleep from Saturday to Sunday (usual ever second weekend) feed them all and 4 adults for lunch on the Saturday. I cooked from 11.30am till 2pm, but had a ball. The photo below is of the second youngest grandchild and she is 6 years old. The lawn/grass is gone, now wait for instant lawn. First one out for the season. That second-youngest has a modeling agent, right? Was very busy that day...will be worth getting the lawn down, but not as scheduled due to the instant lawn being too wet as it rained where it's grown. Instant lawn is new as already grown then cut from the bottom up which contains dirt and roots, rolled and transported to where it will live and become a lawn..
No hay trabajo que se haga más agusto, que cocinar para la familia, con ellos te esmeras en preparar los más sabrosos platos. Tu nieta es muy bella y se ve tranquila y serena. Very satisfying to feed part of our family..
A portrait to be treasured! She's very pretty, love the red curls. I hope the new lawn does well, it's a good time of year for it, cooler weather to help it settle and establish before the heat of summer. 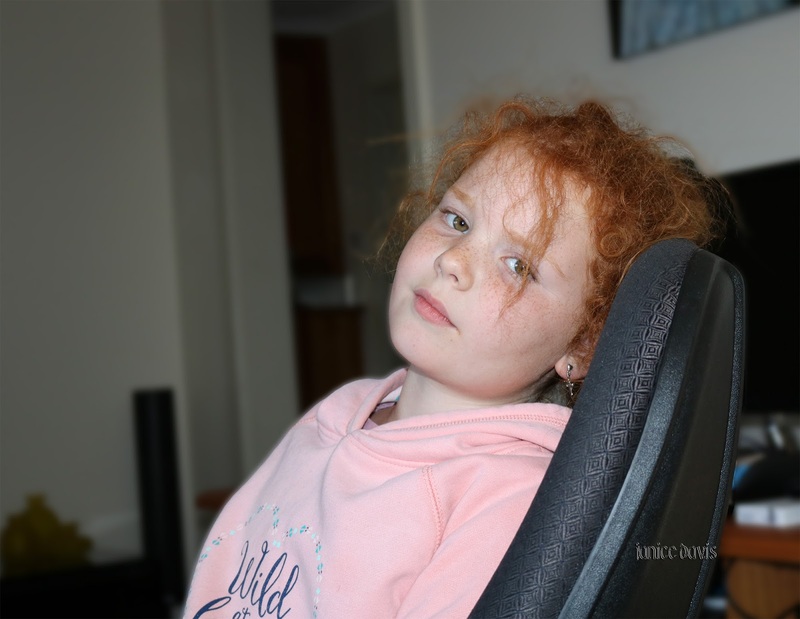 She has beautiful coloured hair and every so curly but she doesn't like the curls - typical.. The new lawn should be good by summer time.. It's lovely hair and long, it's a pretty colour and it's a throw back from her Irish Heritage. She is a honey. Some day we will replace the lawn. For the moment replacing the guttering, restoring the roofing and replacing the heater are enough. 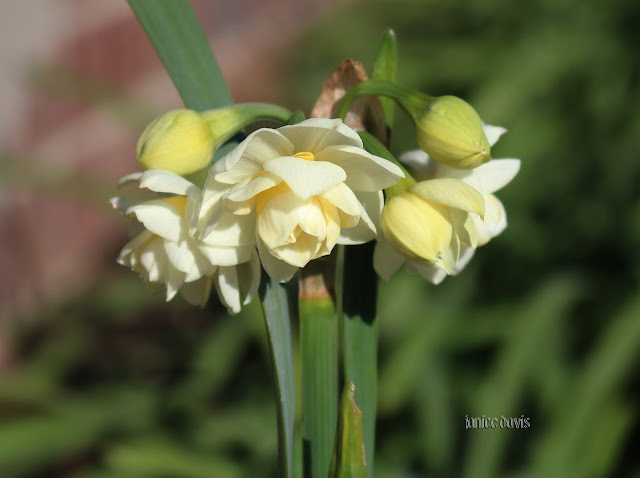 Love your first jonquil. You are ahead of us. You have been working hard. It will be exciting to see the instant lawn go down. It should be nicely established before summer hits. It hopefully will be good by summer Andrew. Intend to grow it about one foot before cutting as the roots tend to do better..
to play vigorous games on much to the horror of good ole Shanks - ha ha. Hope the lawns root will do exactly as you say, they usually do. Can't imagine the children playing on the front lawn whilst new, but out the back there is a large paved area plus a two level lawn. I have lawn envy; we only have multiple bunches of weeds spread madly across the vague lawn space and no matter how often we mow them they refuse to turn into lawn grass. Do know what you mean Jayne, it's not always easy to have a 'lawn'. What a sweet child, beautiful. Bom dia, sua neta é linda, trabalho de casa para varias pessoas ocupa muito tempo, as imagens estão perfeitas. Wow! You certainly would've been kept busy by the sounds of it...but a happy, loving busy. Beautiful colour and beautiful hair, she doesn't like it of course because it's curly! I was the same when I had curly hair and did everything I could to straighten it.. Her mother is a nice looking young women too..my daughter in law. you sound quite busy dear Margaret! enjoy your sweet business with family my friend! best wishes for your plants and lawn my friend! 'Music has no barriers, for it knows all languages'. A touch of Autumn in May. A bit of Woolmers Estate. Lema da semana: Satisfaz os Teus Desejos! Motto of the week: Satisfy Your Cravings! This is not our idea of food! The driveway lots of greenery and no cars.